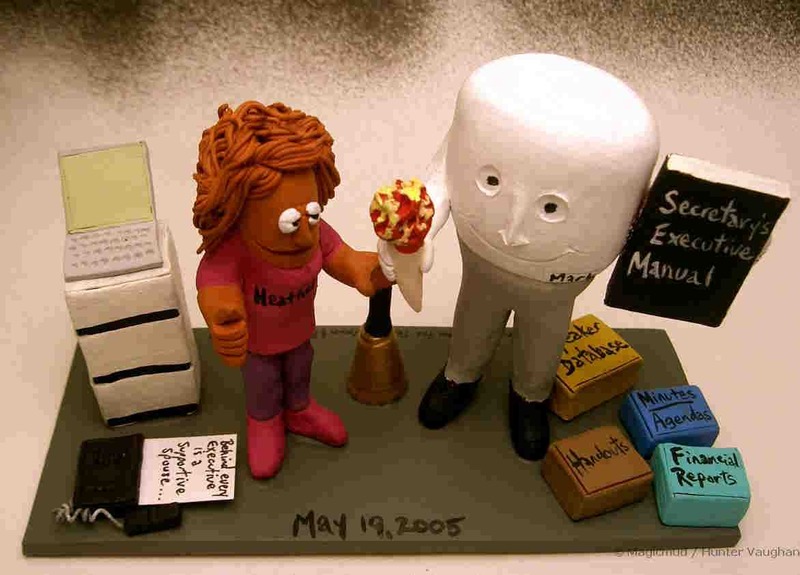 Download our NEW Free Wedding Cake Topper App! 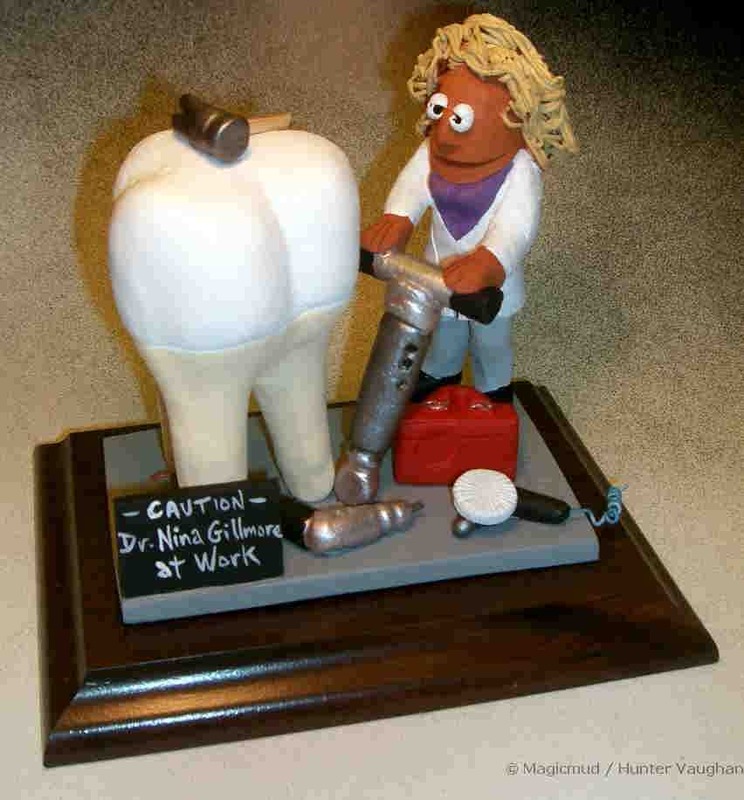 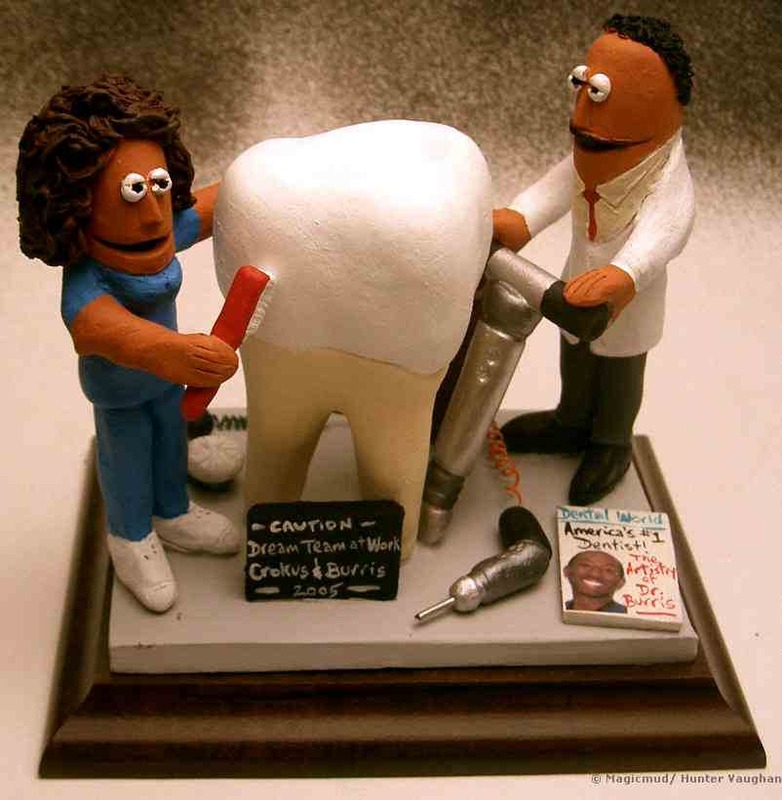 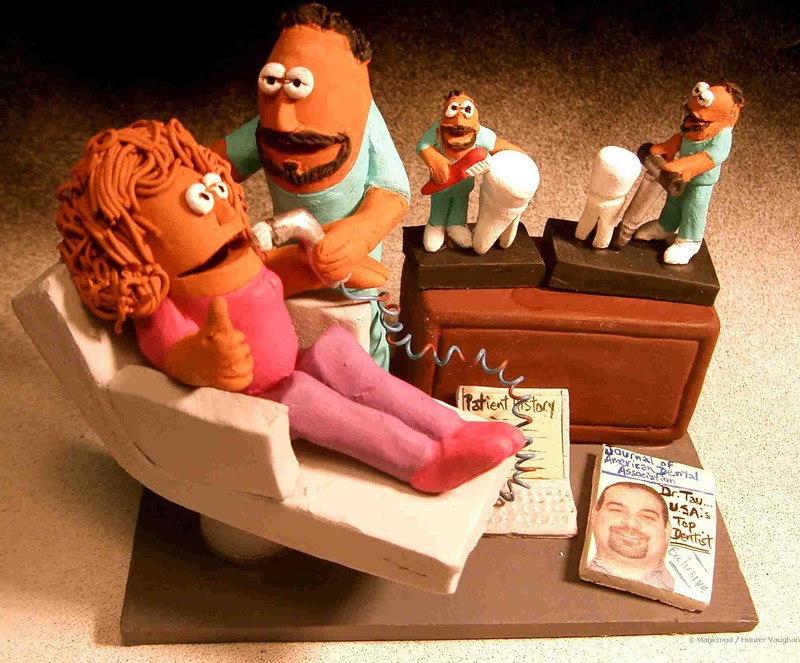 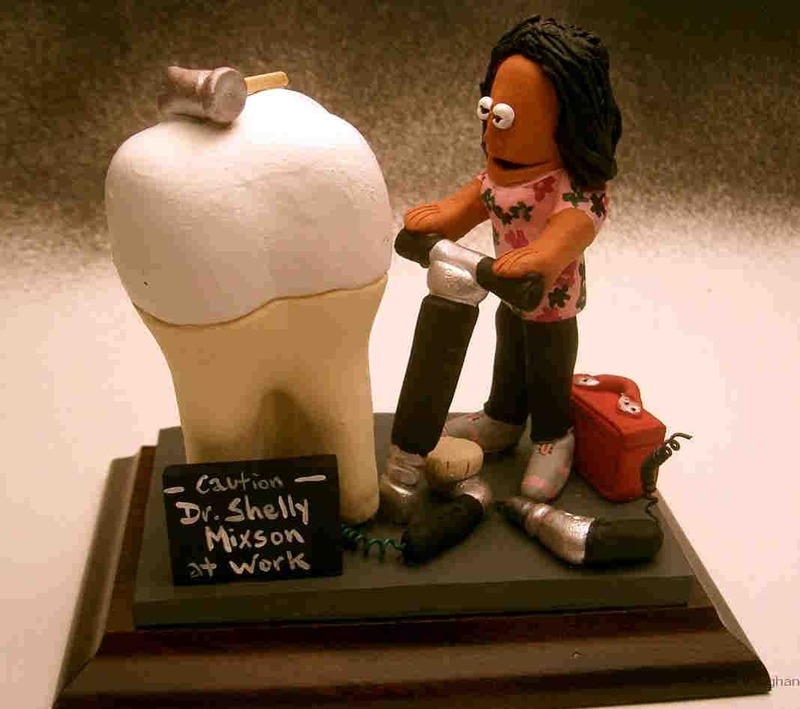 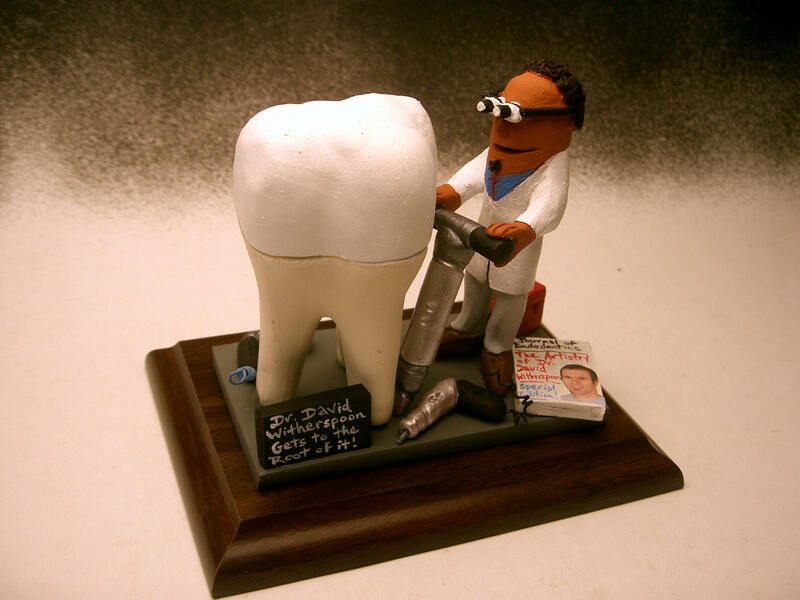 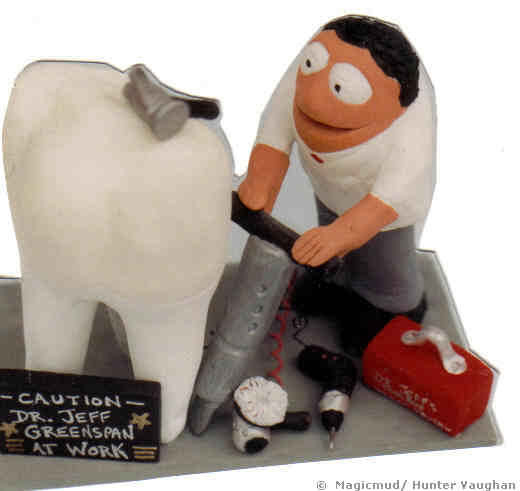 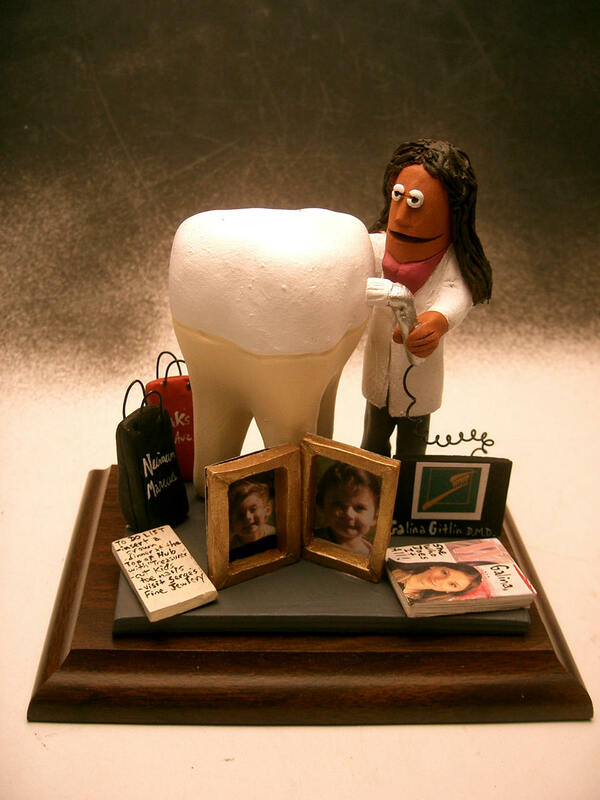 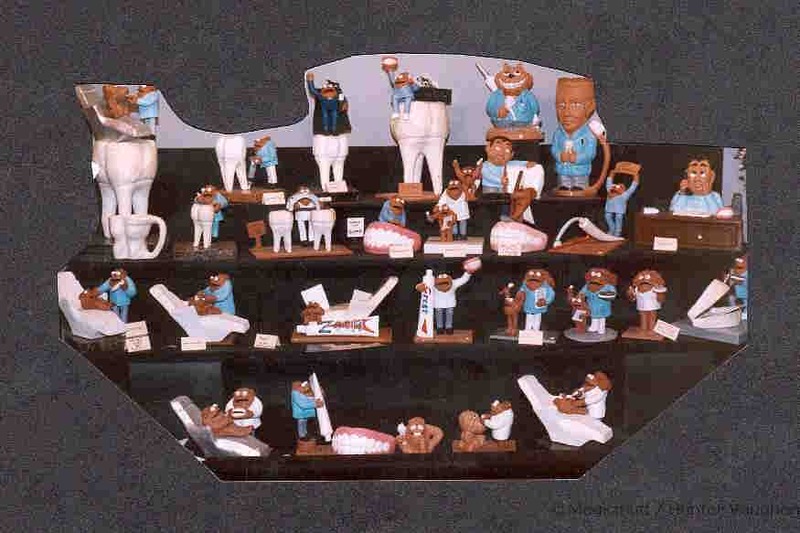 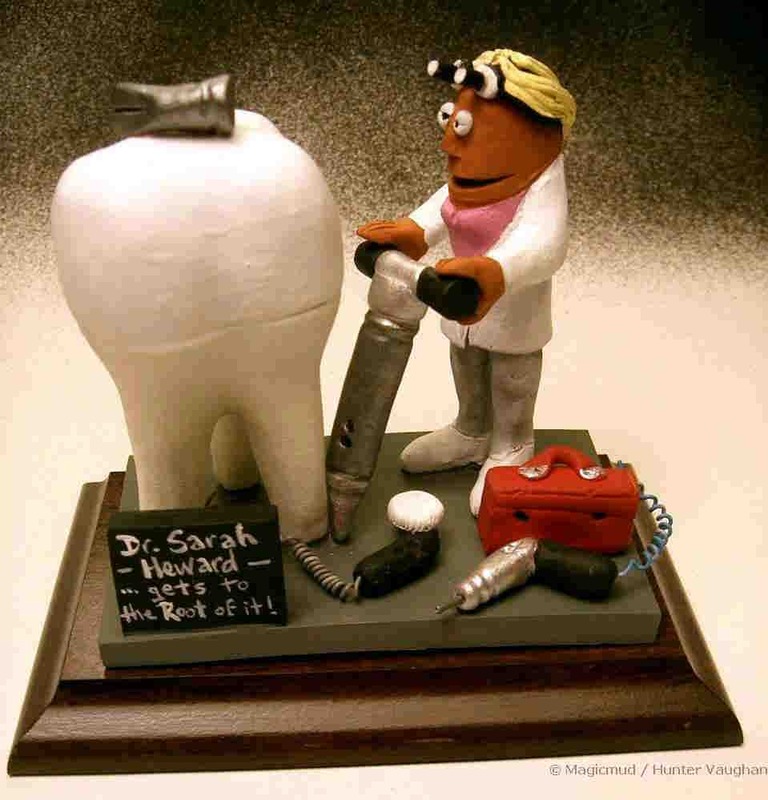 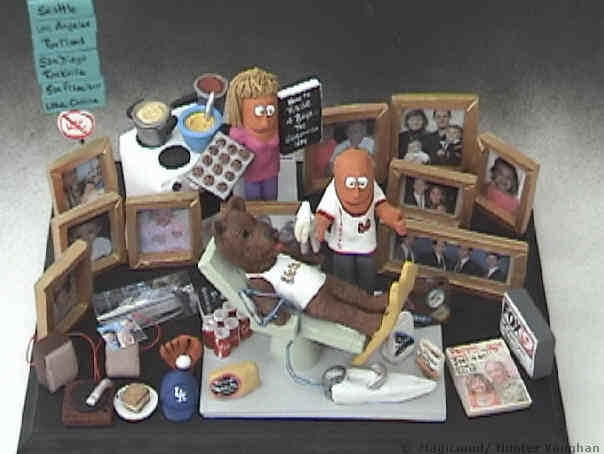 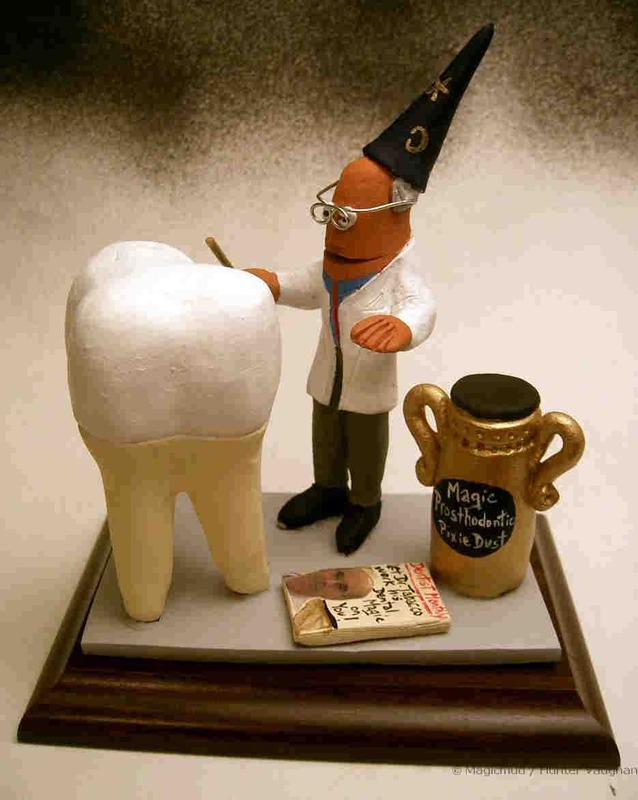 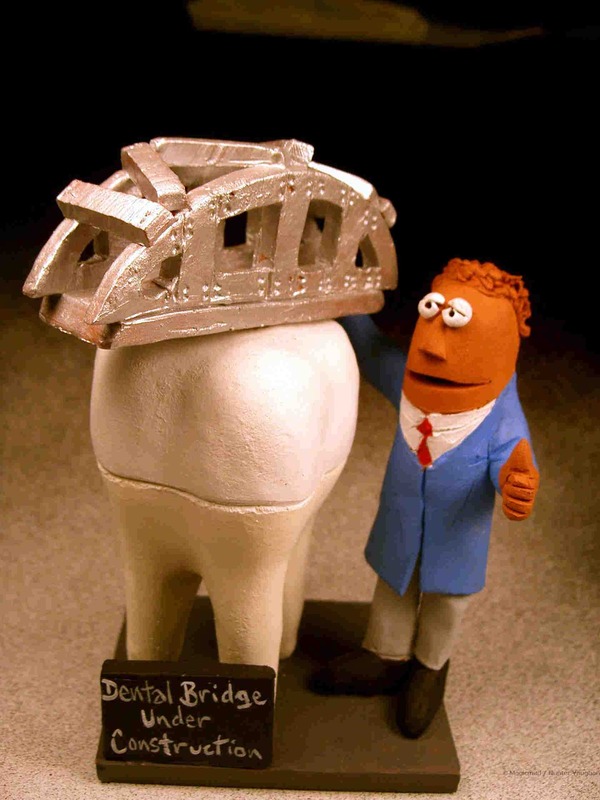 Custom Dental Figurines make Great Dentist's Gifts. 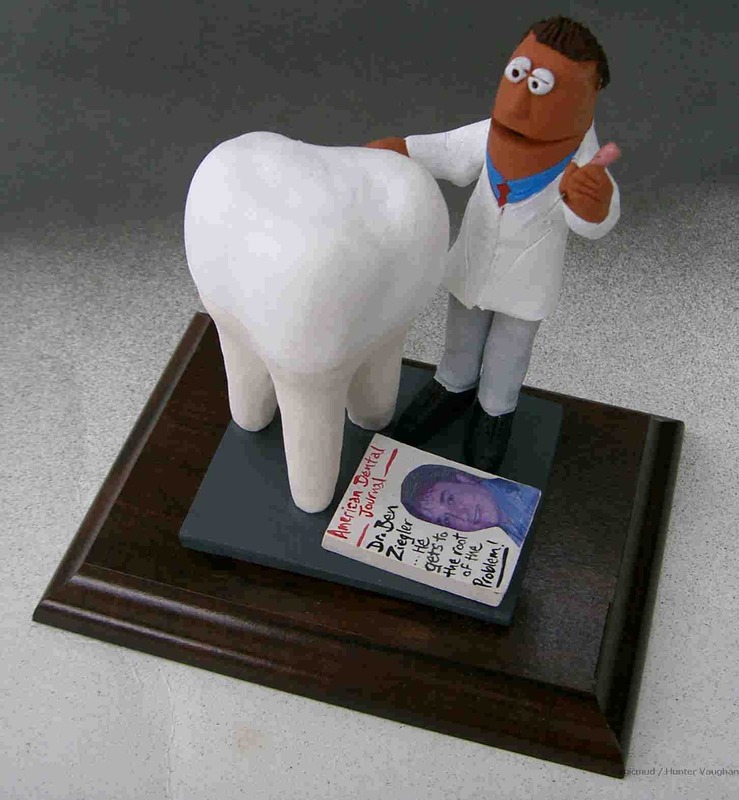 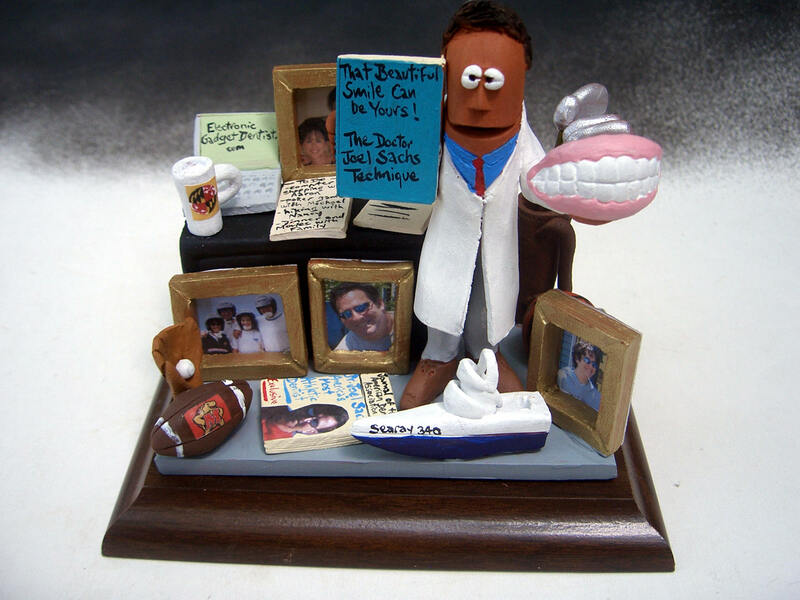 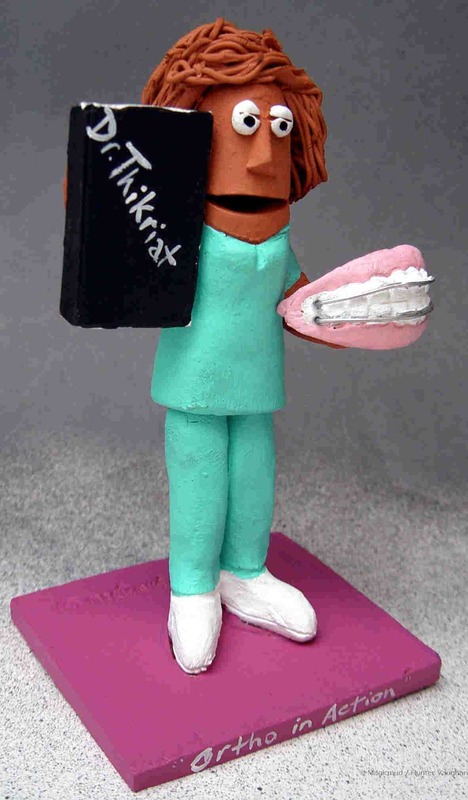 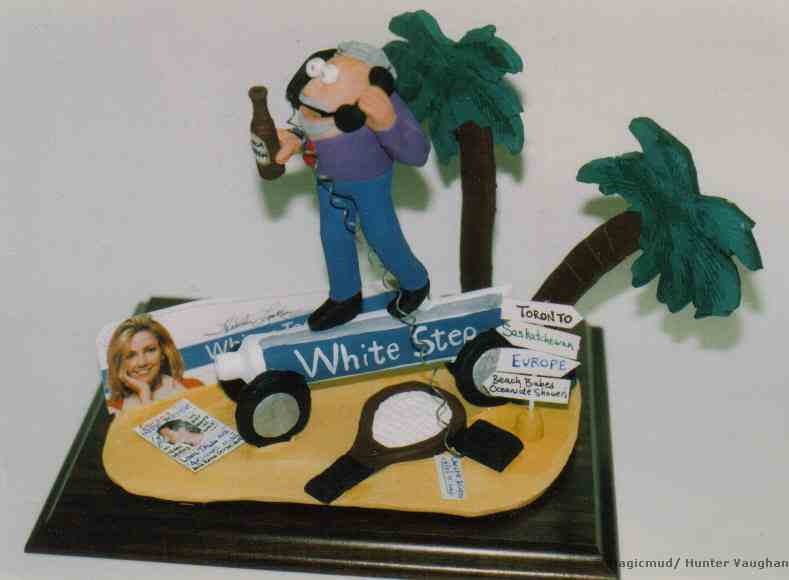 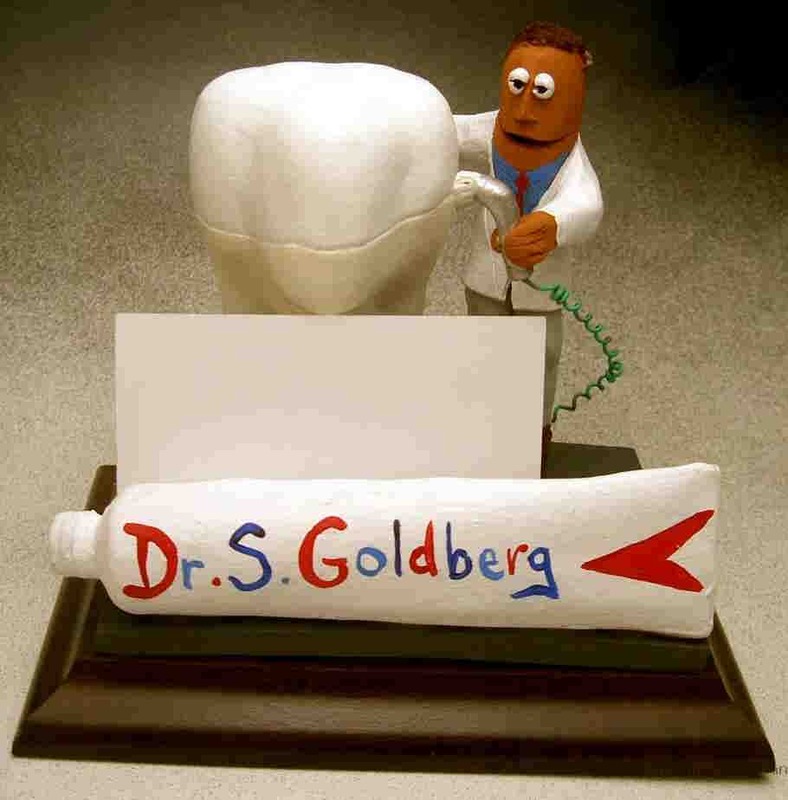 Personalized dental figurines custom-made to order will enliven your office, waiting room or home. 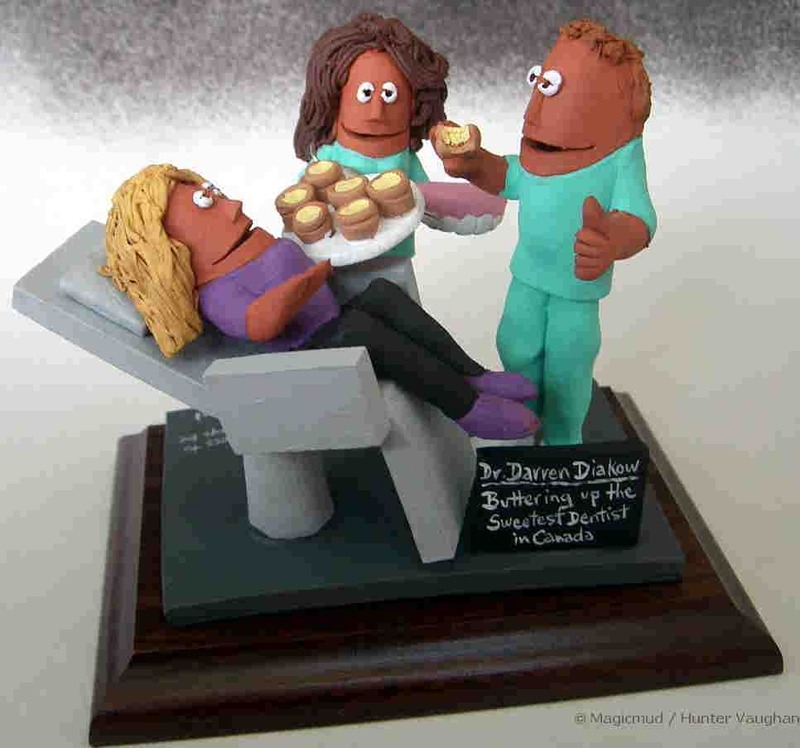 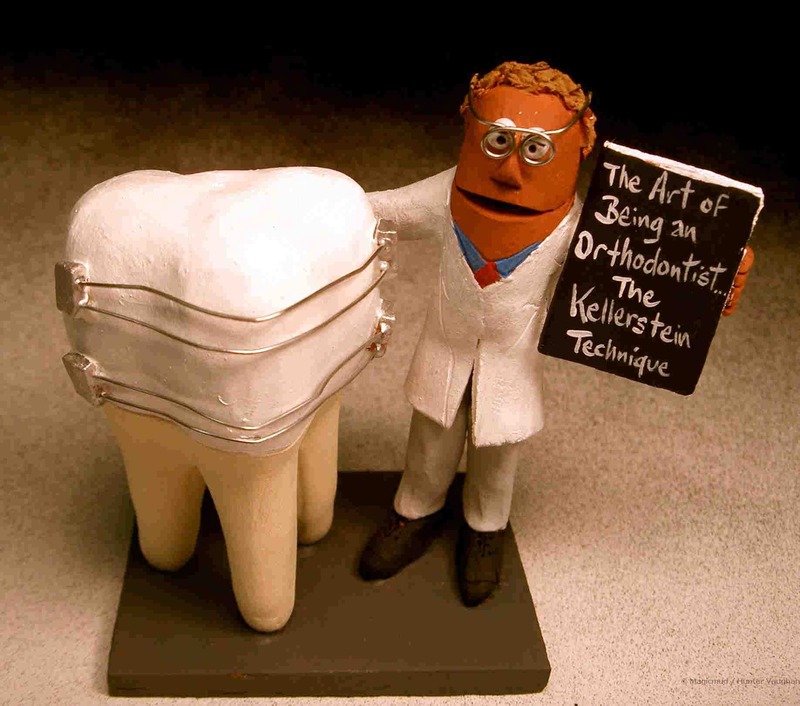 Clay caricatures of Orthodontist, Periodontists, Prosthodontists, Endodontists, Dental Hygienists, Oral Surgeons, and every kind of Dental statue can be created to your specifications. 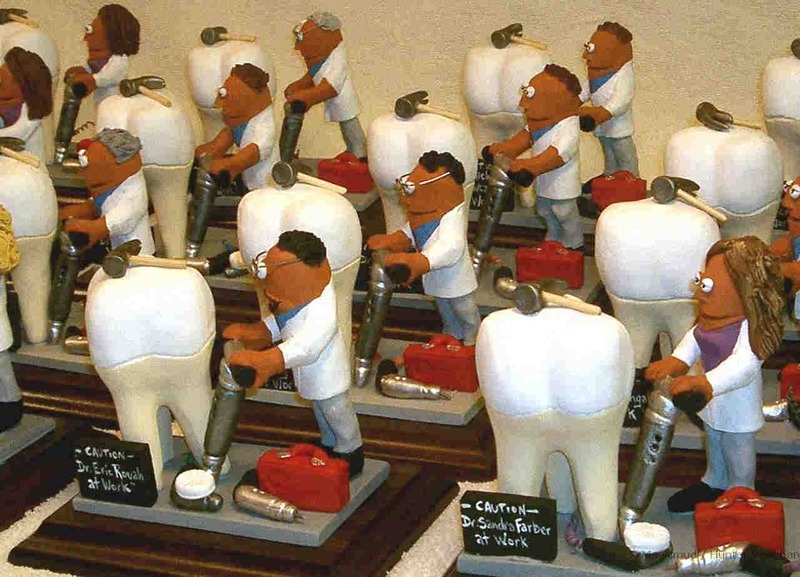 These sugar free delights are the perfect dentists gift. 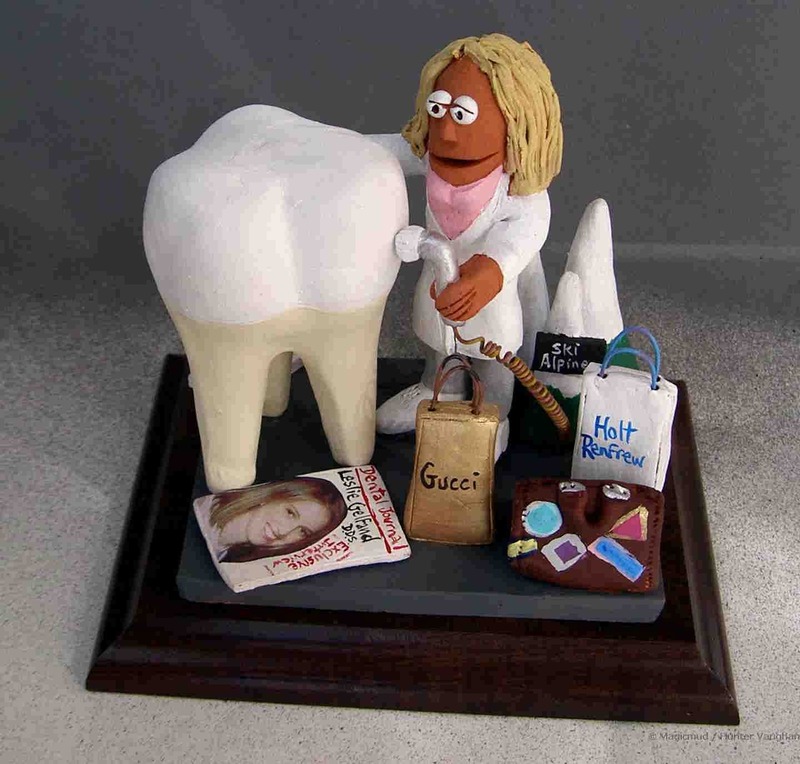 Specifically created to your instructions and budget, they will bring a smile to the person who cares for everyone else's smile. 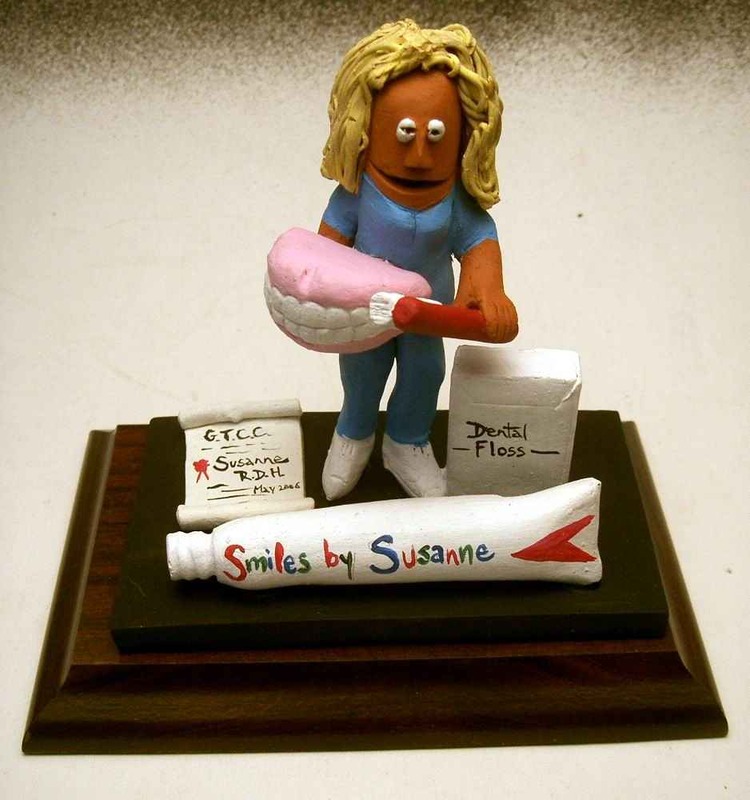 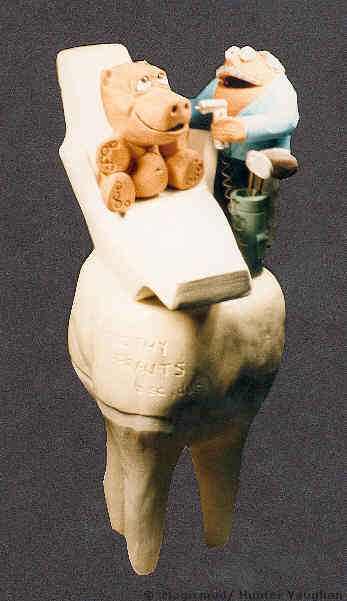 Be inspired by the following photos of past dentist figurines, then contact us to realize your own custom clay character. 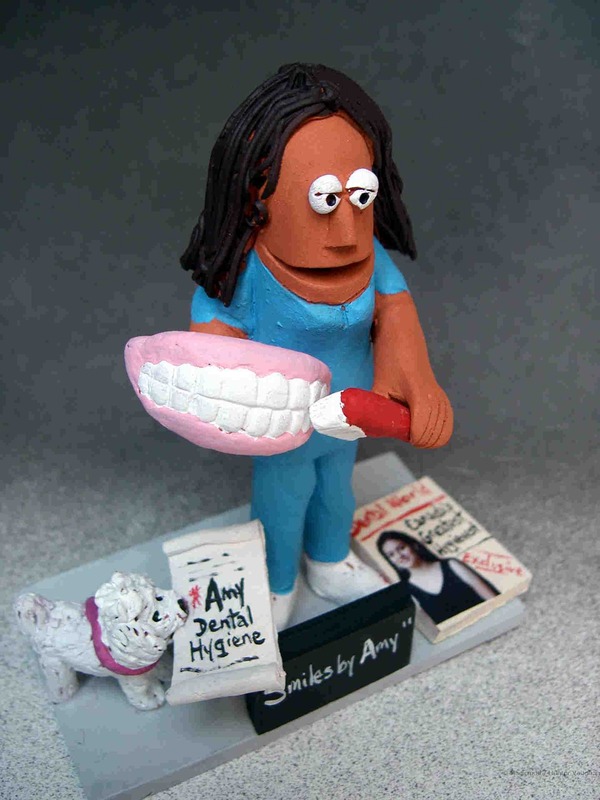 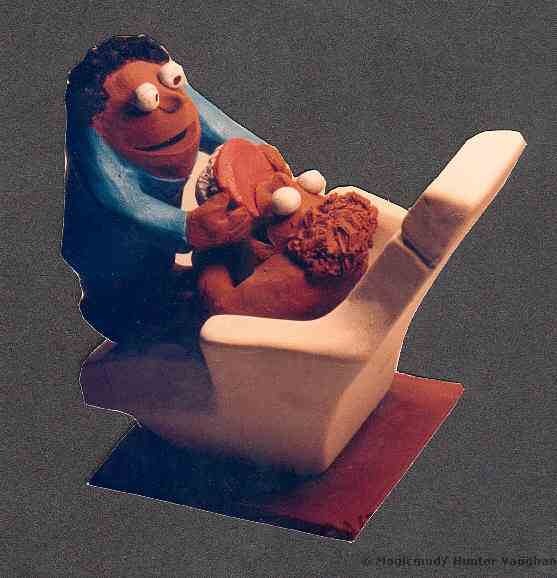 Gift-giving is no longer like pulling teeth with a Personalized Dental Figurine.
" 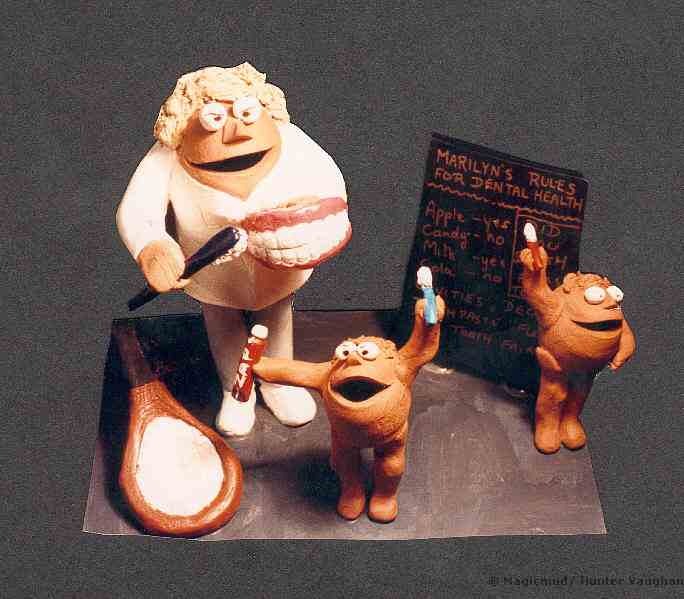 The Dentists Are Coming!!" 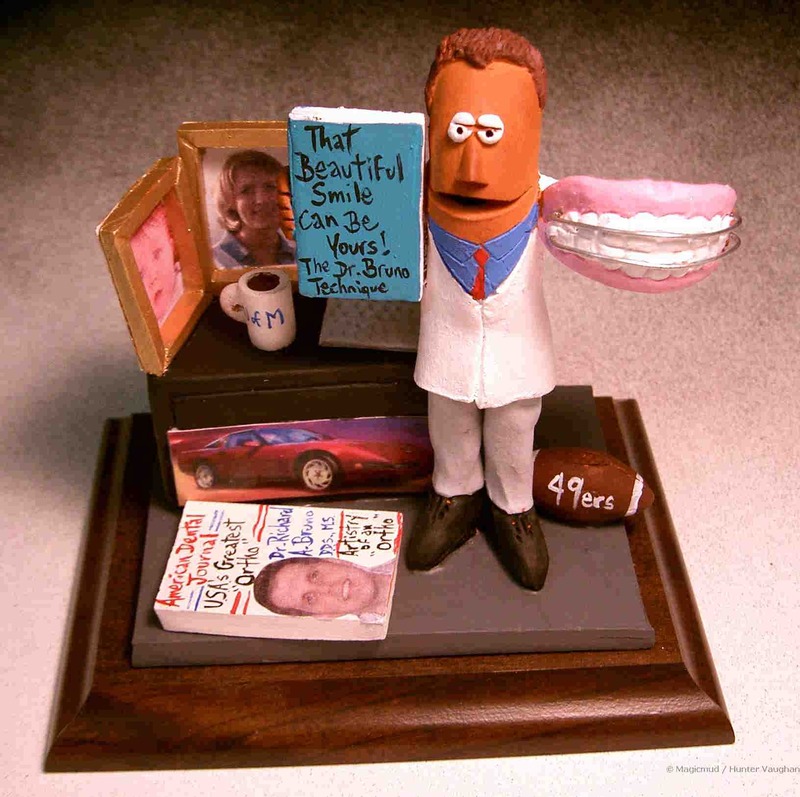 Hunter, My husband LOVED the sculpture of himself (in full dental attire) with all of his favorite things surrounding him. 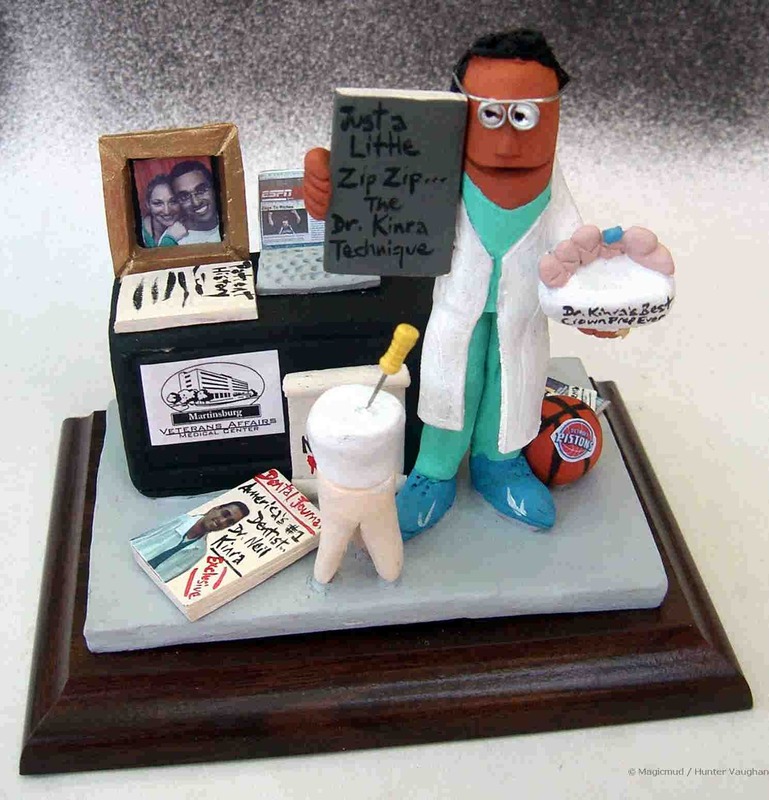 His staff and patients can't stop talking about how original and creative it is! 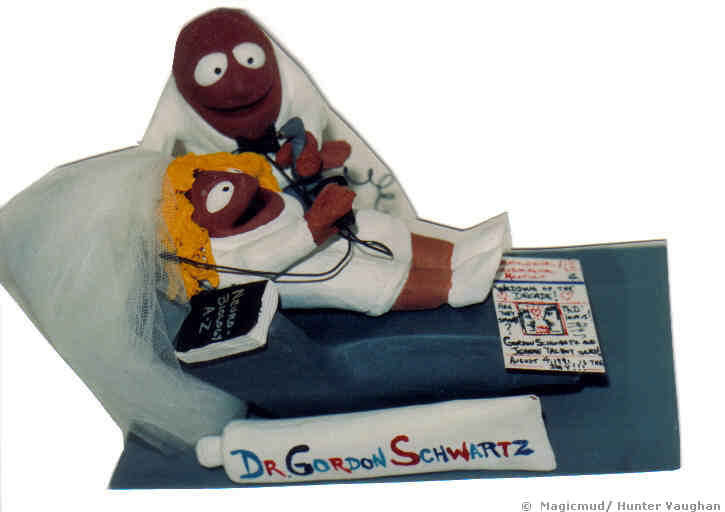 Thank you so much for all of your help in planning this unique gift. 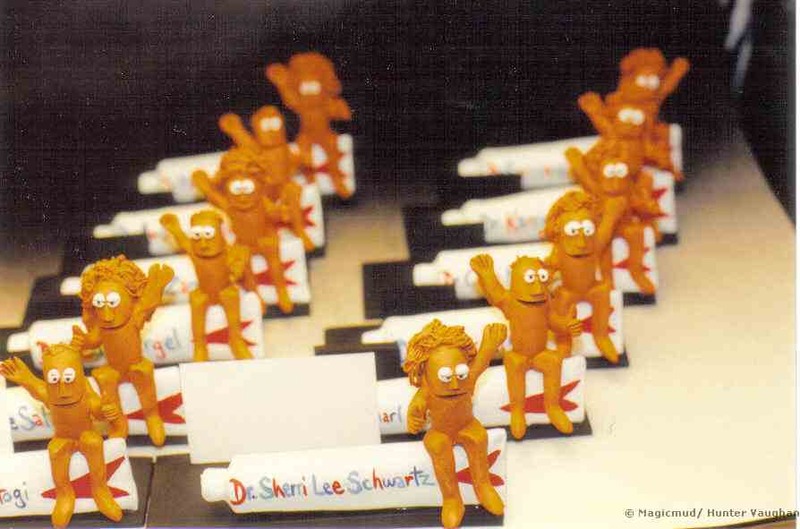 You will hear from me again...Two of my nephews will be graduating from college soon and I can't wait to begin designing their sculptures with you! 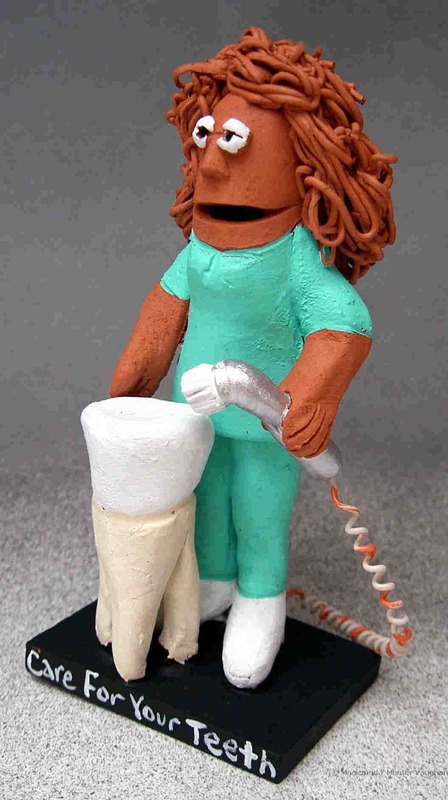 "She gets to the Root of it!" 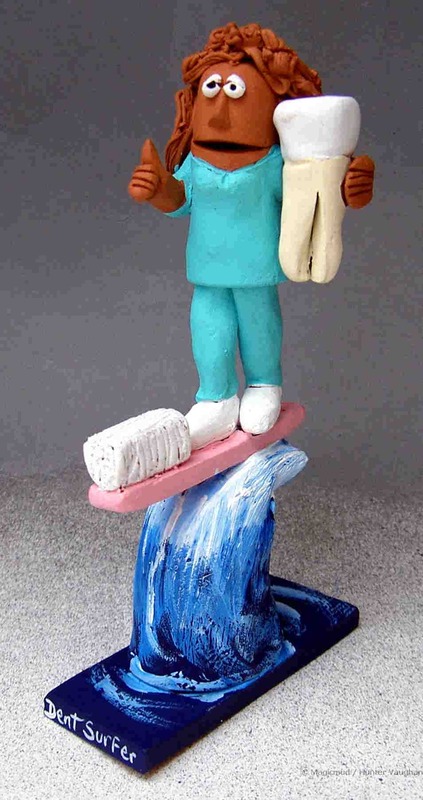 Yes, he came today and I LOVE IT!!!!! 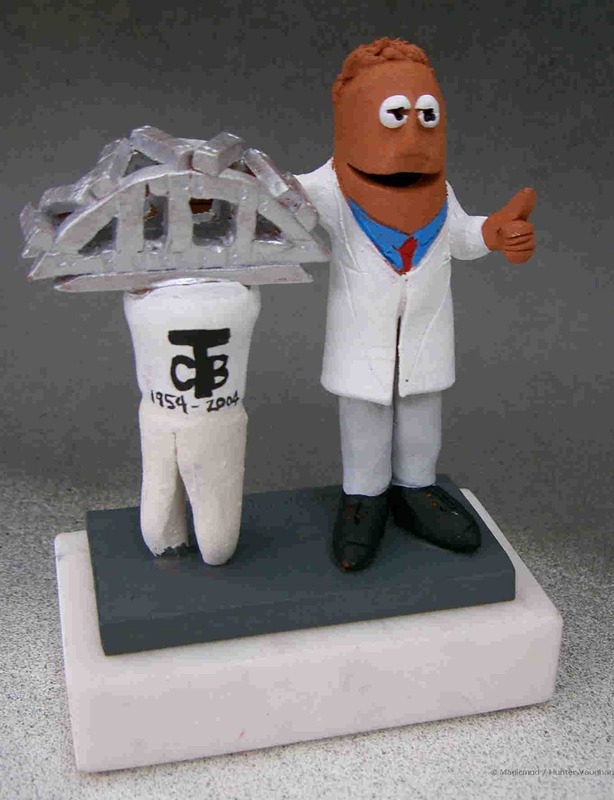 It definitely was worth waiting for. 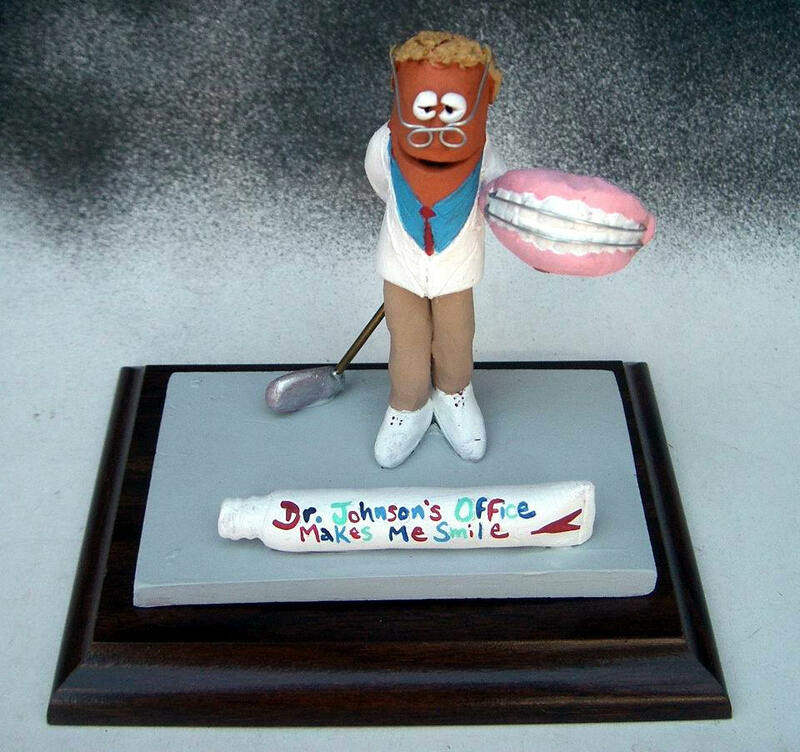 I look forward to my husband's reaction when he opens it. 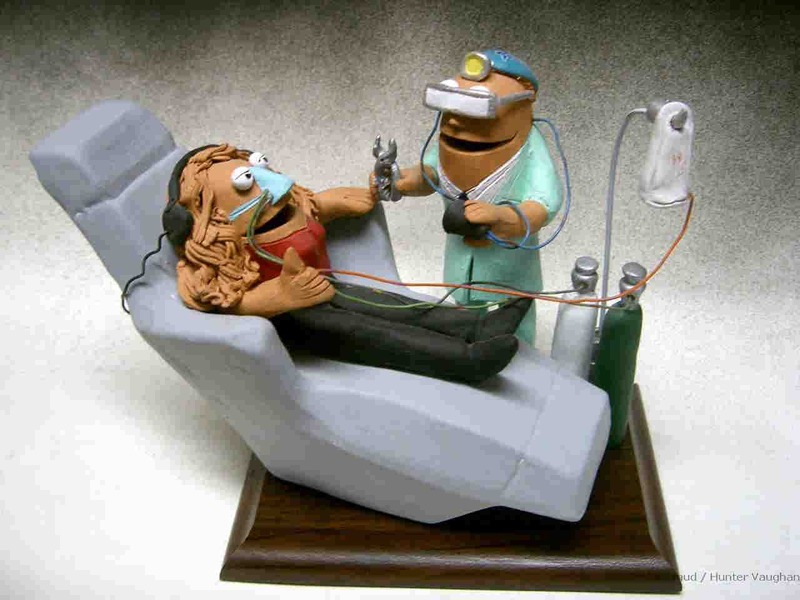 I look forward in the future to ordering some other character. 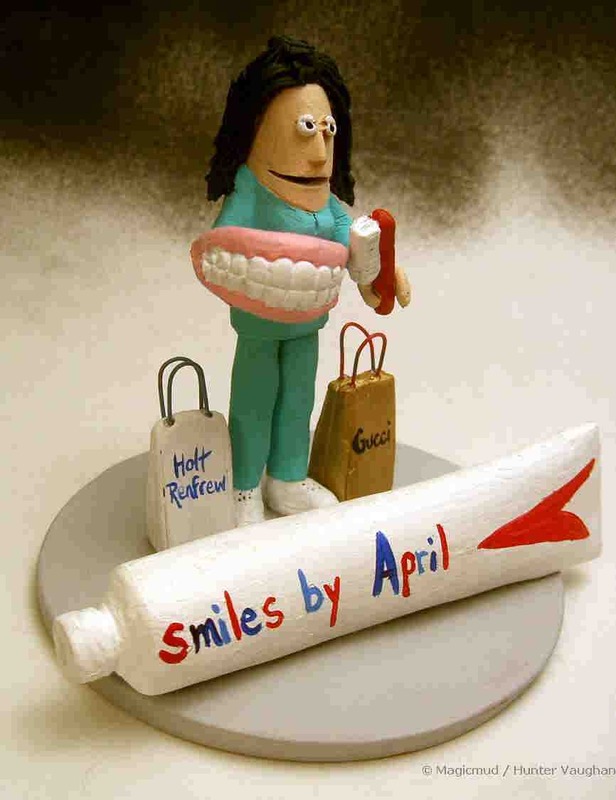 Thank you and Happy Holiday also. 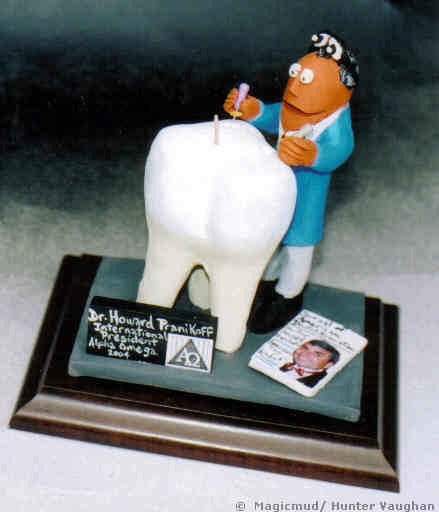 Your figurine was enjoyed and admired by all who saw it, and drew many compliments upon presentation. 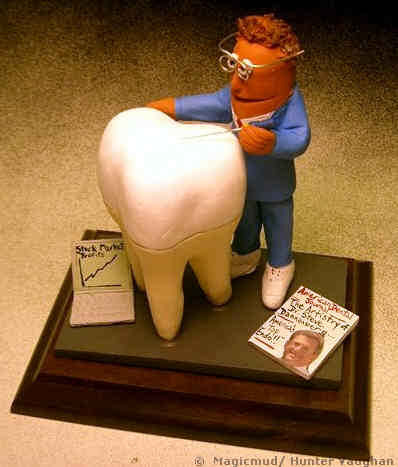 Thank you for your fine work. 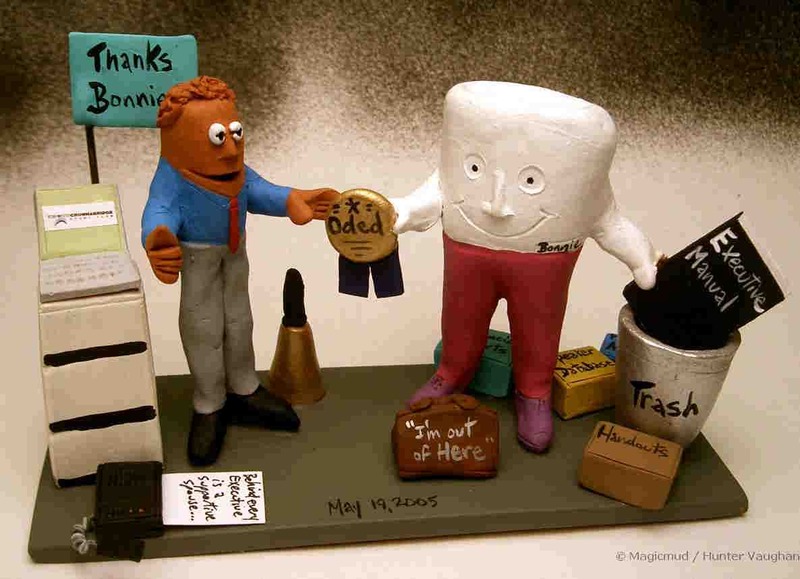 I very much appreciate it. 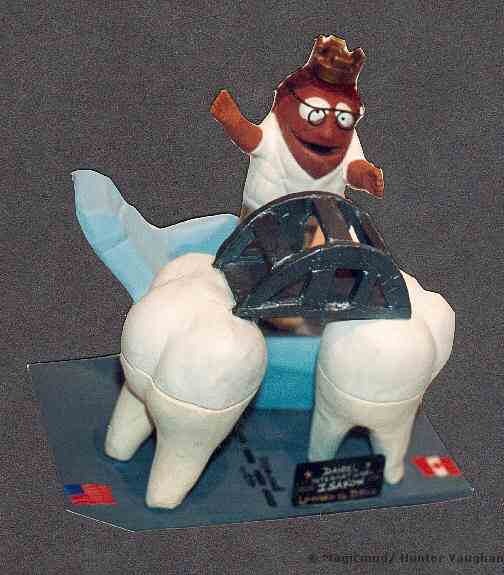 Hunter ...You need to put a warning on the image, I spilled quite a lot of coffee all around my keyboard because I was laughing so hard when I opened it up. 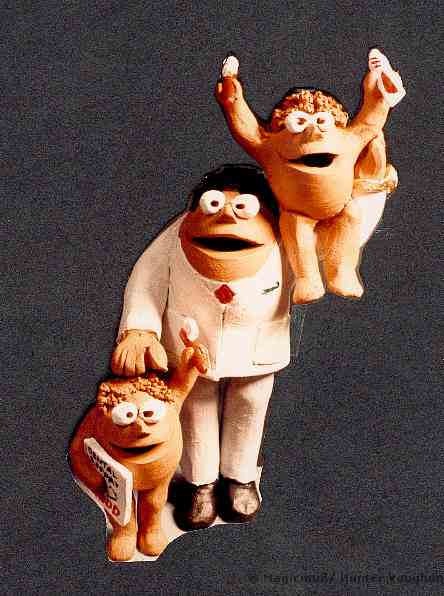 Honestly, it's absolutely incredible. 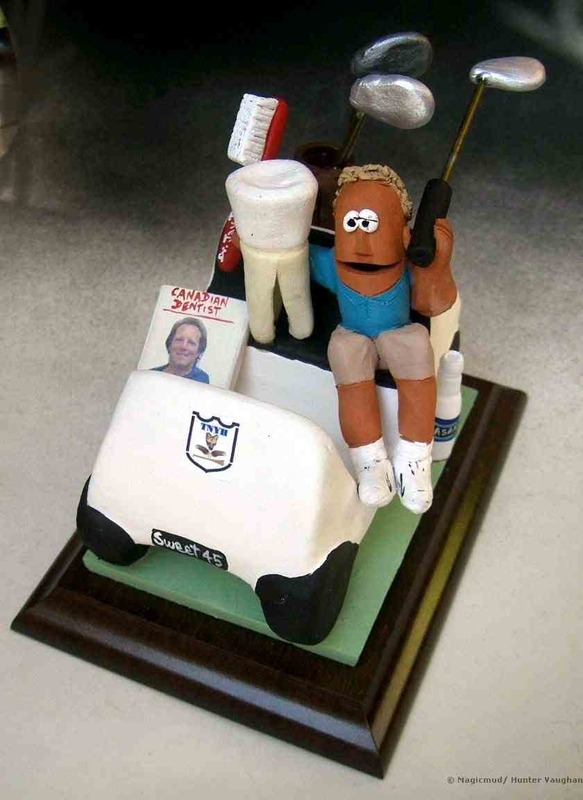 Better than I had ever imagined or expected. 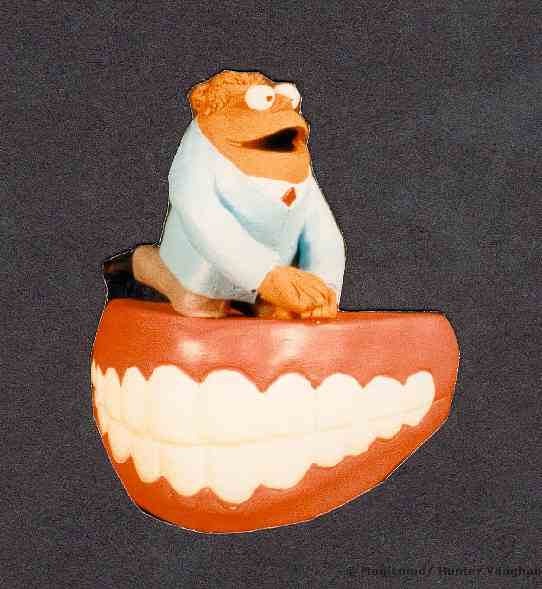 I'd be speechless if I ever got speechless. 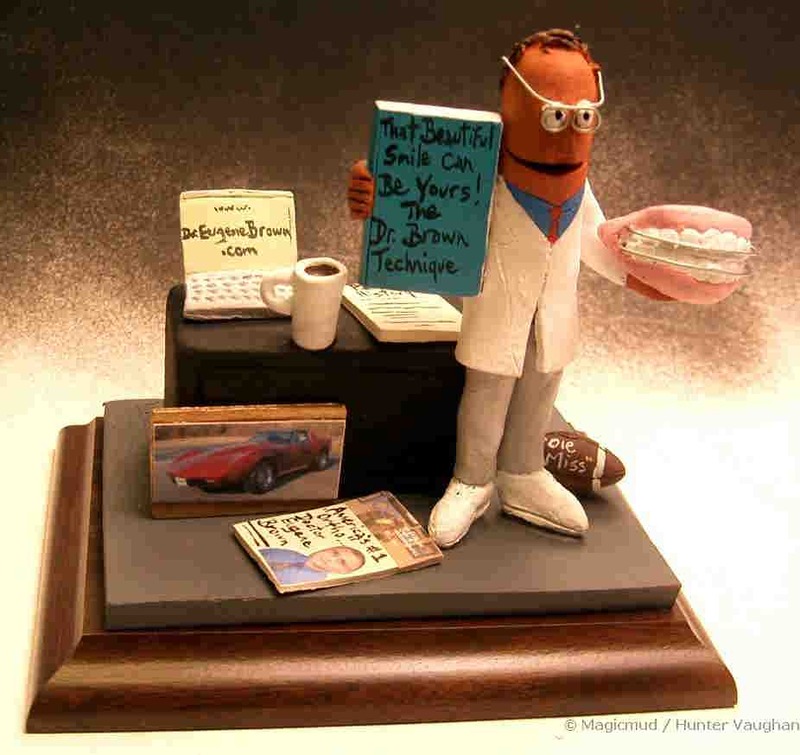 How in the_ world_ did you take my silly idea and make it into something so darned cool? 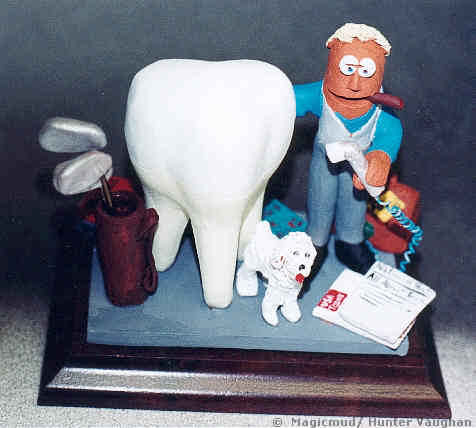 ©2013 Hunter Vaughan, All Rights Reserved. 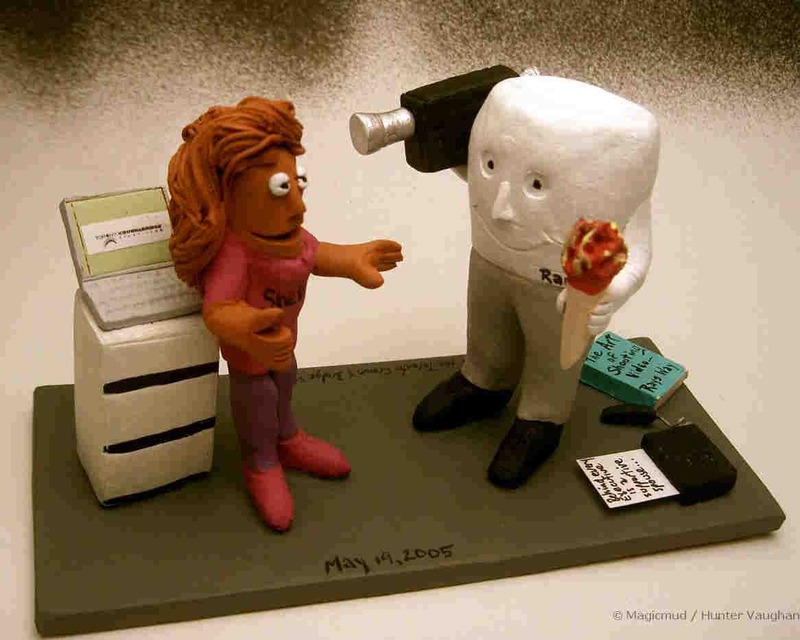 No images on this site may be used, in any form, without the consent of the artist.